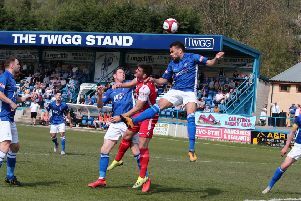 Alfreton Town manager Nicky Law has strengthened his squad ahead of the 2015/16 Vanarama National League North campaign by signing former Chesterfield striker Jamie Jackson. Jackson, 28, has signed a one-year contract with the Reds and becomes Alfreton’s tenth signing of the summer. He progressed from a three-year scholarship with Chesterfield to sign a two-year professional contract and went on to make 20 appearances for the first team. Whilst with the Spireites, Jamie had loan spells with Matlock Town and Gainsborough Trinity before joining the Gladiators. From there he moved on to Sheffield FC, Worksop Town, Bradford Park Avenue - and had a loan at Worksop Town. In recent seasons he has played for Belper Town, Grantham Town and Worksop Town again before a move to FC Halifax Town for the 2014/15 campaign where he made 38 appearances, scoring four times. Jamie is the half-brother of former Chesterfield, Bolton Wanderers and Preston North End striker Kevin Davies.